Once again a big reason the Lakers are near the top of the Western Conference standings ... 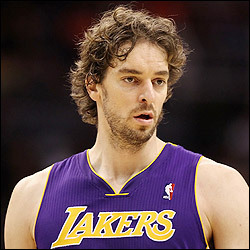 Manned the middle for two straight NBA championship teams with the Lakers in 2008-09 and 2009-10 ... Ranks among league leaders in rebounds, and currently on pace to average a double-double for the second time in his career ... Is the fourth player ever to go straight from Europe to NBA and score 10,000 points ... Was named All-NBA Third Team in 2009 and 2010 ... Was the 2008 European Player of the Year ... Led Spain to an Olympic Silver Medal in 2008 ... Led Spain to the gold medal in the 2009 European Championship and to the gold medal in the 2006 FIBA World Championship while being named Most Valuable Player in both events ... Spent the first six-plus seasons of his career with the Grizzlies, where he still remains the franchise leader in most points, rebounds and blocked shots ... Rookie of the Year in 2002 ... Drafted by the Atlanta Hawks in the 1st round (3rd pick, 3rd overall) of the 2001 NBA draft ... Was traded on draft night along with Brevin Knight and Lorenzen Wright to the Vancouver Grizzlies for Shareef Abdur-Rahim and Jamaal Tinsley. Was traded Feb. 1, 2008 by the Memphis Grizzlies with a 2010 2nd round draft pick to the Los Angeles Lakers for Kwame Brown, Javaris Crittenton, Marc Gasol, a 2008 1st-round draft pick (Donte Greene) and a 2010 1st-round draft pick.